TheTravelzine Italy 2007 - Firenze. The 11:01 train from Pisa brought us to the Santa Maria Novella Stazione in Firenze at 12:23. 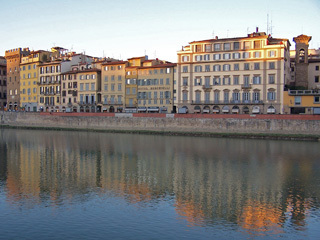 It was a partly cloudy cool day (10C), perfect for strolling to the banks of the Arno and the Hotel Berchielli. We took the underground passageway from the station to Via de Panzani turning left (east) on Via de Cerretani in the direction of the Duomo. We turned south on Via Roma (through Piazza San Giovanni) which becomes Via Calimala after Piazza Della Republica and then Via S. Maria which leads to Ponte Vecchio. Before the bridge we turned right (west) on Borgo SS Apostoli to the cute Piazza del Limbo (home of the Chiese Limbo and its art treasures), on the left, and the side entrance of Hotel Berchielli. The main entrance of the hotel is at Lungarno Acciaiuoli, 14. The trip could have been made in 10-15 minutes but we were in Firenze, one of our favorite cities to savor. It doesnt matter how many times you pass the Duomo, you must pause to capture its magnificence and see the visitors from around the world similarly enthralled. Nor is it possible to walk through Piazza Della Republica without being impressed with its size and harmonious beauty. Fashion, food - Firenze, why not a little window shopping along the way? It's a good thing we travel light and were in no particular hurry. When we stayed at the Hotel Berchielli last year, we were so impressed with the high level of hospitality and traditional comfort and charm that we could hardly wait to return. We especially love the location in the city center adjacent to the Oltrarno, the area on the other side of the Arno River. The hotel was created and expanded by the amalgamation of adjoining ancient houses. Thus the interior corridors and staircases lead in various directions and levels to a wide variety of rooms. The marble staircases with blue and white wrought iron railings are very attractive. A rooftop garden terrace is a wonderful spot for relaxing in good weather surrounded by some of Florence's finest buildings. This hotel has a very special, unique character. The side entrance leads directly to the lobby, reception area and lounge while the Arno entry leads down an arched passageway to a cozy bar and the reception area. An eclectic mix of stained glass windows, quality woodwork and trim in turquoise tones, black and white granite and marble floors, woven area rugs and contemporary furnishings combine in an attractive, comfortable way. There are always at least two staff members at reception, overseen by the affable General Manager, eager to serve their guests. They were proud to inform us that complimentary wireless internet access was now available in the public areas and that some rooms were able to pick up the signal. Since we had our laptop with us, we were happy campers. There is also a complimentary internet point in the lobby for registered guests. Since we had experienced a room with a view of the Arno and bridges last year, it was suggested that we might want a city view this time. In fact we were offered an upgrade to a two level junior suite on the sixth floor. The lower level was elegantly furnished with two oversized upholstered chairs (convertible into single beds), desk, tables and flat screen television. The bathroom on this level had a stall shower. 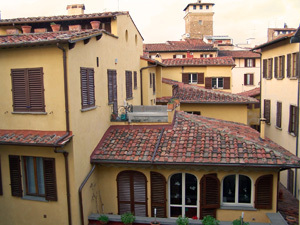 The large window from this room gave us a close-up dramatic view of Florentine homes and their terracotta roof tiles. We had the feeling of living in a neighborhood. The upstairs bedroom was equally beautifully furnished with a king bed, desk, chairs and another flat screen television. The bathroom here had a tub with shower. Both lovely tiled bathrooms were stocked with quality grooming products, and an array of towels. There was substantial closet space on both levels (wasted in our case). It should be noted that the lighting was excellent. The mattresses were firm, as we like, and there were both soft and firm pillows. And yes, our laptop found the wireless access! A substantial breakfast buffet was available in the Grand Breakfast Room. The staff was constantly available to provide hot beverages of choice, clear tables, maintain the buffet and take care of special requests. After settling in we crossed Ponte S. Trinita to stroll through the Oltrarno to check out some restaurants we had heard about and to be sure that there had not been any dramatic changes. Much to our delight everything was as we left it. This is where you can still find craftsmen making quality products by hand. Hopefully they will be able to pass their expertise on to the next generation. Roberto Ugolini on Via Michelozzi, 178, tel. 055-21-6246, was at his work table making a pair of shoes for some lucky guy. It was fascinating to watch him cutting and trimming the fine leathers. It brought back memories of my first summer job in a shoe factory when shoes were still made by hand in North America. Moving on, we came to Mannina, Via de Barbadori, 23-25, tel. 055-211-060. It was closing time but Mr. M welcomed us in and took the time to explain his process, the types of leathers, time frames, etc. His client list is quite impressive; he makes both mens and womens shoes. Linda figured that after paying for the shoes our credit balance would hurt more than her feet so she didnt take me up on my offer. We continued west on Borgo S. Jacopo to Via Santo Spirito into the tiny Piazza Nazario Sauro at the foot of Ponte alla Carraia which is home to Trattoria Dante, where we had a fine meal last year. The owner is a jovial man who is very hands-on and it did not surprise us that he greeted us with, "ah, Canada, welcome back". With the quantity of food we eat it should not come as a shock that we are remembered. Speaking of which, the portions are very generous so we shared three dishes: insalata Beppe (insalata verde, tonno, uovo sodo, acciughe, capperi), spaghetti alla Sigarino (aragosta, seppie, cozze, vongole, gamberi, cherry tomatoes), tagliata di Manzo con Rucola and Parmigiano grana. We settled into the fun, relaxing environment inspired by the hand painted walls, high brick ceiling, loads of wine bottles and our spirited waiter. Our appetites grew as we sipped the house private label rosso, light and fruity, from the Sangiovese grape. Crisp greens with tuna, anchovies, capers and hard boiled egg glistening with quality olive oil was a perfect starter. 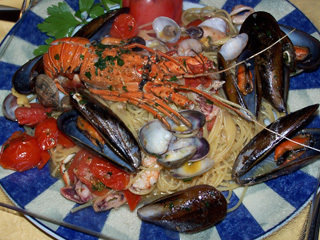 Next we were served delicious spaghetti and seafood: fresh lobster, cuttlefish, mussels, clams and shrimp enhanced by olive oil and cherry tomatoes. The presentation of the sliced steak topped with grana and arugula was as impressive as it was delicious. The cream and chocolate tortes with soft crusts and silky-textured fillings topped with pine nuts and powdered sugar were delicious. Well done Dante - excellent quality, preparation and service at fair prices. Besides a good selection of Florentine favorites, the trattoria is well known for its pizzas. After a grappa digestivo, we walked across the bridge and along the riverside back to our hotel. Crossing over to the Oltrarno another day, we paid a visit to Bartolozzi & Maioli, Via Maggio, 13r, Tel. 055-282-675, world famous for creating exceptional wood furniture and furnishings. The founders daughter, Fiorenza Bartolozzi, has successfully carried on the family tradition, founded in 1938. 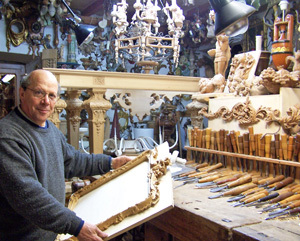 They specialize in re-creating antique works as well as their own designs. The results are dazzling; the skills involved, the years of training, the work required to achieve excellence is abundantly clear. Looking to the future, they are working with institutions in the industry to find and train candidates in the art. We met one of the trainees, a young woman from Hamburg, Germany, who was carving a book from wood; her apprenticeship would last 6 months. We walked east along the Borgo S. Jacopo turning right on Via Ramaglianti to #8. If we did not have specific information about how to find this place we would never have known that Aliani e Perini & C.S.N.C. Orafi, traditional purveyors of the goldsmith craft, was located in this nondescript building. It was quite intriguing to watch a demonstration of gold being melted, cooled, flattened thin through a machine, heated for pliability, a pattern drawn, distressed with chisel and hammer, polished with a file, edges cleaned, and finally a glistening piece ideal as an earring or charm. All this was accomplished in 30 minutes, on old and worn working surfaces with ancient implements by highly-skilled hands. The owner mentioned that Via Ramaglianti was Via de Giudei in Roman times and that a building right nearby was the location of the old Synagogue. We managed to find the plaque marking the location. Over the years we have passed through Piazza Della Signoria hundreds of times and stood in awe of the massive Palazzo Vecchio, taken photos of it with the copy of Michelangelos statue of David in front and the adjacent Loggia dei Lanzi, its size and crenellated exterior denoting a formidable fortress. The original palace was completed in 1314. During the middle of the 15th century Cosimo the Elder added significant renaissance decorations and during the middle of the 16th Cosimo l deMedici enlarged the palace for his vision of a grand-ducal court. A new section was added that doubled the size. Today the palace is home to the Town Hall of Florence with many rooms available for public viewing. It was finally time to go inside! 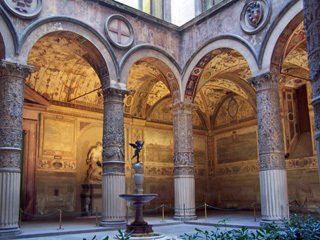 The courtyard was designed by Michelozzo. A copy of the statue of the Winged Boy with a Dolphin on top of the porphyry fountain by Battista del Tadda occupies the center (the original by Verrocchio is on display on the second floor). The stunning columns are richly decorated and high above are the crests of Church and City Guilds. Francesco, eldest son of Cosimo I, married Johanna of Austria, sister of Maximillian (the rich get richer) and the frescoes along the walls were done by Giorgio Vasari to celebrate the wedding. The Salone dei Cinquecento (room of the 500s), was built in 1494 as the seat of the Grand Council consisting of 500 members. The size (52m x 23m), decorations and art make this a dramatically imposing chamber, the centerpiece of the palace. The original ceiling was raised 7m and although I didnt find out the height I know that you will get a stiff neck from looking up. You do have to look up to see the 39 panels painted by Vasari (who was responsible for all the decorations of the hall) and his assistants, which represent episodes from the life of Cosimo I. Bands of frescoes high on the walls just below the ceiling depict the history of the city and episodes of city life. The walls are covered with huge frescoes that depict military victories by Florence over Siena and Pisa. 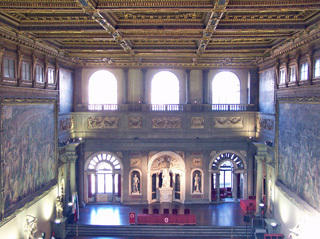 At the front of hall is the Udienza, a stage, built by Bartolommeo Bandinelli for Cosimo I to receive prominent citizens and ambassadors. Three statues represent the Medici dynasty. In center stage is Pope Leo X, to the right is Pope Charles V crowned by Clement VII. Michelangelos famous marble group, The Genius of Victory is in a niche at the rear of the hall. Another of the Michelangelos works is of a man beating a woman. Across the way, in striking contrast, is one by Giambologna of a woman beating a man - very democratic. There are six statues along the walls dedicated to Hercules as a symbol of the Republican Age. At the end of the hall is a small room without windows that was built by Vasari for meditation. Cupboards along the wall contain paintings and sculptures and are covered with artwork representative of the treasures contained within. The enormity of the hall is most evident from the corridor high above  the people in The Salone dei Cinquecento below were tiny! The adjoining rooms used by the Mayor as offices are now available for public viewing. One room has a carved wooden painted ceiling the panels of which are mirrored by the magnificent stone floor below. Theres also a painting of Pope Benedict. The Siege room was the Mayors office. There is a large painting of Florence surrounded by troops with weapons ready for attack. The room is further decorated with a painted carved wood ceiling, frescoed walls and a multi-toned terracotta floor. Hard to understand why the Mayor vacated. Up to the second floor and the Apartments of the Elements, the private quarters of the one and only Cosimo I. The Room of Elements is filled with allegorical frescoes representing water, fire and earth. The fascinating ceiling represents Saturn and a marvelous fireplace dominates one wall. It was a pleasant day so we were allowed to go out on The Terrace of Saturn to capture some great city views. The private chamber of Eleanor, wife of Cosimo I deMedici, is a series of rooms with frescoed ceilings dedicated to females. 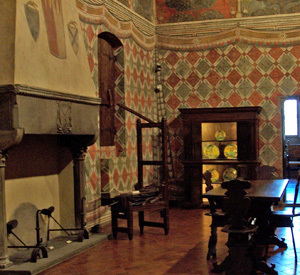 Sala dell Udienza, room of the judge, contains the oldest decorations of the palace. The carved wooden ceiling is laminated in pure gold. The large wall frescoes done in soft pastels depict stories of Roman history. A marvelous doorway, with marble moldings and carved woodwork, leads to the Room of the Fleur-de-lys (Hall of the Lilies) dedicated to relationships with France. A doorway flanked by two ancient marble pillars leads to the Hall of Geographical Maps. The cabinets along the walls, where the Medici Grand Dukes kept their valuables, are decorated with 53 16th century maps and oil paintings which are of important scientific and historical interest of that period. A huge globe, Mappa Mundi (1567), and the original statue of Judith and Holofernes by Donatello have prominent positions in the room. Adjacent is the original room where Macchiavelli worked when he was secretary of the Republic. A terracotta bust and portrait mark his presence. In the middle of the room is the original Winged Boy with a Dolphin. It was a pity we could not take the journey through the Corridor, the secret passage from the Palace Vecchio to the Pitti Palace, which is available only by prior appointment by groups at a fairly large fee. This amazing route, which starts at Palace Vecchio, goes through the Uffizi and adjoining buildings, across the Ponte Vecchio through buildings on the Oltrarno and ends at the Pitti Palace. The Medicis used this corridor to avoid the common people. Tonight we found our way to one of our favorites, La Casalinga, Via Dei Michelozzi, 9. You know youre there when you see the line up of motorbikes along the sidewalk in front. The family members are always present, happily greeting patrons and pointing them toward a table in either the front or back room. The regular menu and daily specials offer basic Roman recipes simply prepared. As usual, there were tempting special items from which to choose. Linda selected penne al sugo della nonna, followed by brasciola di maiale ai ferri. Tagliatelle al carciofi (artichokes are in season and we had them every way possible during our trip) and branzino al forno were my choices. The pastas were a work of art. The pork chop was tasty and tender and the whole fish was grilled crisp and moist inside. Substantial portions of quality home cooking at extremely reasonable cost will keep us coming back. The main store of Salvatore Ferragamo is a few steps from our hotel at the corner of Lungarno Acciaiuoli and Via de Tornabuoni. Around the corner at Piazza Santa Trinita 5r, in the Palazzo Spini Feroni, is the entrance to the amazing Museo Salvatore Ferragamo. This private museum is dedicated to the history of the Ferragamo company, the life of founder Salvatore Ferragamo and his footwear creations. I cannot begin to tell you how impressed and captivated we were to see the collection that spans the masters entire career, from his return to Italy in 1927 to his death in 1960. Only someone who had a combination of highly technical and artistic skills and the creativity in choosing colors, materials and blending them into unique designs could produce a collection such as we had the privilege of viewing. Salvatore Ferragamo not only had the ingenuity to mix and match colors and innovative materials into exquisitely styled footwear, but to develop the crafting techniques to bring his creations to reality. Each shoe on display is a treasure. Find time to go between 10:00 and 18:00 except Tuesday when it is closed. Take a virtual tour on the Ferragamo web site. Our good value food search brought us to Piazza San Lorenzo and after fighting through the leather coat dealers we fell into Trattoria Toscana Gozzi Sergio at #8. Having been in business since 1915 we figured it must have some substance. Since Gozzi is only open for lunch and we had to put it to the full test. This would be our big meal of the day. Oh my, what a terrific find. The menu changes daily so it would be easy to eat here every day. Zuppa di porri was a hearty grain and bean preparation and fagottini di pasta fresca in brodo di gallina was real chicken soup with little sacks of fresh pasta filled with ground meat, squeezed closed at the top - think dim sum. Linda claimed to be stuffed after her thick soup, but managed to sincerely make love to tender ravioli with ricotta and spinach al sugo (meat sauce). Chicken soup was a teaser so I added a side of fagioli all olio to my tender arista di miale al forno (pork chop in the oven) with incredibly tasty gravy. It is common in eateries like this to find your dining neighbors eager to chat and trade favorites - no exception here. We now have enough suggestions to keep us going for a while. Great food, service and dining companions in a totally laid back environment with incredibly reasonable prices makes us devotees. When we visited the Officina Profumo  Farmaceutica di Santa Maria Novella, Via della Scala, 16, two years ago, the new museum was in the formative stage. It is now open to the public with a collection featuring the original vessels used for mixing and storing the ancient preparations. 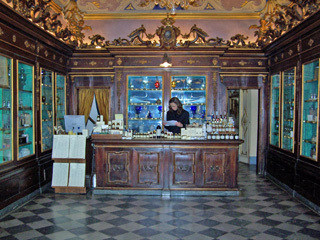 The pharmacy founded by a Dominican monastery in 1221 was opened to the public in 1612 in the antica speziera where the herbalist shop is housed today. Its a pleasant trip back in time. Ancient formulations and newer adaptations are beautifully packaged and presented in the original showrooms. The aromas will captivate your senses and the knowledgeable staff will answer all your questions. We discovered attractive little tins of delicious pastilles, which make great gifts for special people. Every visit to Firenze we head to Vivoli for their famous gelato but every time we go, it is closed. Everyone we asked assured us it was open, away we went but once again, it was closed. Does Vivoli really exist? We ended up at Grom, at the corner of Via del Campanile and Via delle Oche, near the Duomo. Its a chain which we first encountered in Genoa. The gelato is made with natural products, not too sweet, with pretty good flavor. I was telling the manager of our hotel of our frustration at not being able to find our kind of gelato in the city. He suggested we try La Bottega del Gelato, Via Por S. Maria, 33r. This is one of the main tourist streets in Firenze which leads to Ponte Vecchio. How quickly we forget! This was the first gelateria in which we had gelato in Italy in 1978, the year the shop opened. We had no basis for comparison then but we and our children thought it was good enough to return twice a day for our 3 days in the city. Its still pretty darn good (excellent flavor and texture without overpowering sweetness) and will be our Firenze gelato headquarters from now on. After getting caught up on our email and reading the Toronto newspapers online we were off. One of the hotel staff had heard of our gelato search and told us of a dairy and gelato emporium way east on the Oltrarno side of the river. It was a glorious, sunny, relatively warm day, perfect for a long stroll. We started going east along the cityside bank of the Arno planning to cross over at the Ponte alle Grazie. Along the way, we remembered a restaurant that had been recommended and popped up to Corso Tintori to check it out. The menu looked interesting, the aromas were positive and the owner was an agreeable fellow. We made a dinner reservation  more on that later. Continuing east along Tintori we encountered a stream of folks eating slices of very good-looking pizza. This was followed by the smell of fresh baked dough. At #11r we found the culprits, Amore Mio Pizza where Mom was in the back churning out the beauties while her daughter tended the counter. This was our kind of pizza, real wheat dough, rolled thick, baked dry with flavor enough to enjoy on its own. Now add fresh quality toppings and herbs and you have a winning combination. Its sold by the slice, nice size slices at very fair prices. We opted for the classic margherita which is the true test of pizza as far as were concerned. This was the real stuff. The line-ups were justified. We were on a roll. After crossing Ponte alle Grazie we continued east along Via di Niccolo to Piazza G. Poggi and no sign of our gelato destination. Its was true that the exact location was not clearly defined nor did we have the name of the place, so we thought it was time to ask for help. A waitress in a local bar came to our rescue; the news was good and bad. Yes, she knew of the place and yes, the gelato was very good, but, it was closed for the season. Not all was lost. 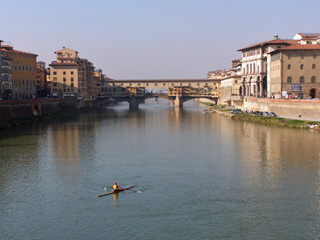 This area between Ponte Vecchio and Ponte alle Grazie and destinations east is a very pleasant, pretty neighborhood with many restaurants and shops worthy of our attention in the future. Later in the evening we returned to Ristorante del Fagioli, Corso Tintori, 47r, tel. 055-244-285. An open cucina is to the right as you enter; the large pots of soups and sauces looked and smelled wonderful. The chefs stopped their chopping and stirring long enough to deliver a friendly bona sera. The owner seated us in a wood paneled dining room and explained the preparation of every item on the purely Tuscan menu. After careful consultation we decided to share pappa al pomodoro (tomato based ribollita) and ribollita alla paesana. Both versions were delicious, thick with finely chopped bread and vegetables but they were served lukewarm and the portions were too small for the price, our only quibbles. Secondi were excellent in all aspects. Linda had crocchettine campagnole (meatballs with potatoes) and I, roast rabbit with a side of fagioli and fennel, dressed with fine-quality olive oil. Portions were ample and very good value. Ricotta cheese cake was served with a touch of chocolate sauce. Preparations are top notch in quality and execution. House wine is served by the bottle, the red a good Sangiovese; you pay for what you consume. Chiese San Michele on Via Calzaiuoli in the center of the city was built in 1337 as a grain lodge. Constructed on the site of a kitchen it is known as Orsanmichele, kitchen garden of St. Michael. It was converted into a church of the craft and trade guilds between the end of 14th and beginning of the 15th C. The 14th century ground floor Roman arches formed the loggia of the grain market. Inside two of the side pillars are the original grain chutes which moved the grain from the third floor storehouses to the ground floor. The guilds commissioned statues of their patron saints to embellish the façade of the building. The ones seen today are copies while the originals are preserved in an adjacent building. A gorgeous ornate tabernacle protects a painting of Madonna and Child. The nearby Oratorio della Confraternita di Dan Martino dei Buonomini is one of the oldest charitable institutions in Firenze. It is worth a visit to see the 15th century frescoes covering the walls. Going east on Via Dante Aligheri on the way to visit the Bargello Palace we stopped into Badia Fiorentina, home of a young religious community where the monks and nuns maintain a tradition of contemplation and prayer. The Monastic Fraternity of Jerusalem was founded in Paris in 1975. Approaching Bargello Palace we were struck by the handsome Volognana tower adjoining the Palace. The Bargello Palace is also known as the Palazzo del Popolo (Palace of the People), since it was originally built for the heads of the Florentine Government. It was in turn a barracks and prison and now an art museum. 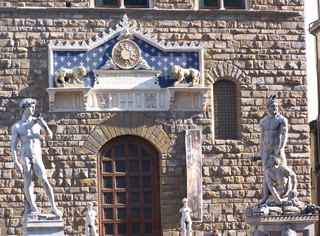 It is the oldest public building in the city and its crenellated design became the model for the Palazzo Vecchio. The two-story building is designed around an open courtyard with Mayors coats-of-arms as decoration and an open well at the center. The museum houses one of the most important art collections of Gothic and renaissance sculptures in the country. There is also a very fine representation of decorative art; ceramics, tapestries, textiles, silver, coins, ivory, bronze, jewels and some armor. Much of the collection is from the Medici family. We were impressed by the huge marble statue Oceano by Giambologna, the most important sculptor between Michelangelo and Bernini who worked only for the Medici family. His nudes in movement and small bronze works were impressive. 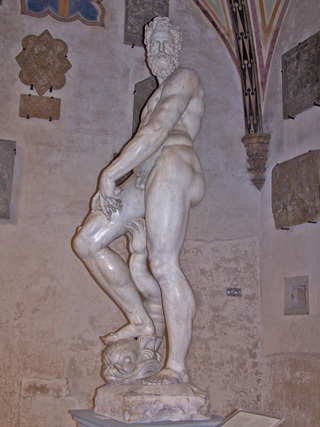 Michelangelos first statue God of Wine is historically significant. His unfinished works, such as the unfinished bust of Brutus, were his way of expressing his feelings and ideas. Other famous works illustrate his genius in presenting the human body in graceful harmony. There is a superb bronze collection by Cellini. Particularly impressive was the magnificent bust of Cosimo I with an intense facial expression. A marvelous grouping of animals by Giambologna is presented on the second floor terrace which leads to an enormous room which was used by the Mayor. This room contains the work of Donatello, including his elegant David, intense St. George and the amazing terracotta bust Riratto di Niccolo da Uzzamo. Donatello is credited with being the first to express individual expression and character. We had passed Ristorante Pennello, Via D. Alighieri, 4r, tel. 055-29-48-48 earlier and were attracted by the light wood framed exterior. A glance at the menu and interior made a positive impression, so here we were for lunch. We were greeted by the owner, the affable Gino, who makes it his business to get to know everyone who crosses his threshold. The rooms were filled with locals, business people and shoppers, all of whom Gino knew by name. We soon discovered that the buzz, reflecting enjoyment of the food and environment, was justifiable. Linda did not need much convincing to start with the house made pappardelle al cinghiale, which she declared to be perfection. I was delighted to find zuppa di farro on the menu and to have it prepared properly thick and served hot, pure ecstasy with the touch of luscious olive oil I added. We had superb agnello al forno (roast lamb) with fresh young spinach. Lemon gelato was a refreshing finish. The house rosso was excellent. This was another great find; a caring host and cucina, quality ingredients and preparation and good size portions at very fair prices. Our next stop was at the Church of Santa Trinita, in Piazza S. Trinita. Francesco Sassetti, a wealthy Italian banker, acquired the rights to the chapel at right of the main altar. Domenico Ghirlandaio was commissioned to paint frescoes of the life of St. Francis of Assisi, which are marvelous, as is Ghirlandaios altarpiece, the Adoration of the Shepherds. Palazzo Davanzati is located nearby at Via Porta Rossa, 13. This splendid home, built in the middle of the 14th century, was owned by the Davanzati family from the beginning of the 16th century until 1838. The current owners are restoring the palace to depict the way of life of a wealthy merchant family during the renaissance period. Looking up at the tower from the inner courtyard, we could see the balconies of the three floors above but only the first floor was available for viewing when we were there. This structure is an example of the evolution of a casa-torre into a marvelous palace. The restoration has been done with great care to preserve as much of the original design and materials as possible. The original wall frescoes, window shutters and doors have been restored and repainted and the original wood ceilings and brick floors are still in place. 15th century life at home is further illustrated by a collection of furniture and furnishings including a toilet, a hole in a ledge. There is also a small museum of lace works, needle and bobbin lace and a collection of looms. This evening we returned to La Casalinga for tortellini a sugo coniglio, roast chicken and potatoes, mixed salad and house rosso - pure comfort for the senses and wallet. Until now we had done our best to control the urge to take advantage of the multitude of SALDI signs in every store. When we arrived in the country, merchants were offering reductions of 20% to 50%, now we were seeing 50% to 70%. At this level even with the conversion to our Canadian dollars, prices were becoming appealing. So today would be devoted to shopping and eating. Lunch was a terrific budget choice while dinner was an exceptional gourmet dining experience. The hunt for low cost value eating brought us to Piazza D. Mercato Centrale. The market is well known for the lunch counters inside. We had never found a worthwhile eating establishment of any kind around the outside area but today was the exception. Via Rosina runs at an angle off the northeast corner of the Piazza. The tiny Trattoria Mario is at #21 (lunch only), to the right as you enter the street. After wiggling through the people waiting for their names to be called, I managed to let one of Mario's sons know that "Don" would await his turn. It took about 20 minutes to be called. What a scene: shared tables and bodies jammed together on low stools to maximize the available seating space across from the semi-open kitchen with the daily menu on a chalkboard. The menu selections were traditional Roman dishes at extremely reasonable prices. 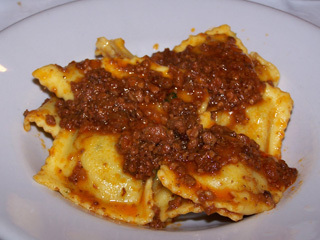 Linda ordered tortelli di patate al sugo cinghiale and the waitress seemed pleased when I ordered my wild boar stewed. Both were delicious. Dont come to dine but for a fun eating experience. Great value! For our last night in Florence, we planned a special dinner at one of the citys finest restaurants, expensive, but excellent value for the experience. Alle Murate, Via dei Proconsolo, 16r, resides in the restored Palace of the Guild of Judges and Notaries where the art and history of Romanesque Florence is united with gastronomic excellence for an evening of sheer pleasure. This medieval public building was resurrected after 500 years of oblivion. Its ancient architecture and frescoes are in dramatic contrast to the smashing contemporary design of the restaurant. We passed through the portal into the front lounge with its stone walls, light wood panels, attractive seating and subdued lighting making an initial positive impact. The staff greeted us warmly, took our coats and led us to our table in the main ground floor dining room. We were awestruck by the sight of the frescoed vaulted ceilings and surrounding walls. Here we were in modern Firenze but in the midst of a magnificent circular representation of the medieval city. Our hostess offered to take us on a tour, which we accepted. A wide wooden stairway at the rear led to the exquisite first floor dining room for a close look at the frescoes. 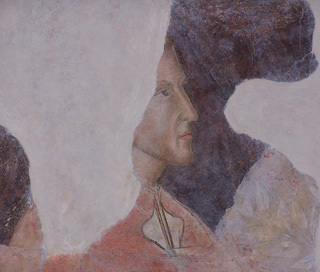 The earliest confirmed portrait of Italy's greatest poet, Dante Alighieri was pointed out to us. The stone cellar is an ancient Roman archeological site. The visible wells provided water for dying clothing. Dining rooms have been carved out of the stone foundation to offer a unique venue for special events. We came to dine and dine we did with superb service, timed for our relaxation and enjoyment. Each item on the menu was explained in detail. Its a romantic experience with soft jazz and water running down the glass wall of the cucina. Crisp, dry prosecco from the north was a fine aperitivo. A bevy of starters included; octopus marinated in orange, fennel and olive oil, celery salad with slivers of smoked tuna and egg roe, and turnip soufflé topped with fabulous sun dried red peppers crisply fried. A full bodied red wine, Basilicata-Carato Venusio Aglianico dei Vulture, 2001 had a lovely lingering cherry flavor. We sipped and savored until our primi arrived. Lentil soup for me, a thick, rich version with mussels and red pepper and Tortellini for Linda, filled with eggplant in a sauce of butter, thyme, parmigiano, garnished with crisply fried shredded eggplant. 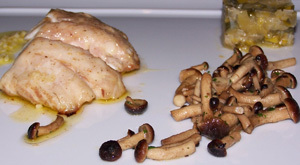 Our mains were filet of bass in ginger sauce and porcini mushrooms and roasted free range lamb from Castentino stuffed with artichoke, sided with battered fried mushrooms and shallots. At this point we were delighted, every dish was divine. We had to have dolce to put Alle Murate to the final test. A platter of assorted pastries sealed the deal. Dark chocolate cake, Bavarian cream, apple pie with custard cream, and orange cake were a dream accompanied by a luscious Vin Santo. Coffee was served with truffles filled with cherries but we had to pass. Value comes in all shapes and sizes and the Alle Murate experience qualifies. If your budget allows, make reservations. Dinner only is served. Closed Mondays. Tomorrow we were off to the Province of Arezzo, first to the city of Arezzo and then on to Cortona.